The moment our IsaBody Finalists had all been waiting for finally arrived on Sunday at Celebration. Having built up the hype on stage in front of a crowd of almost 1000 people, it was time to crown our 2019 IsaBody Challenge® Grand Prize Winner for Europe. After tragically losing her partner, Kathryn Harrold was at rock bottom. At the beginning of 2018 she decided to make a change and put herself first. “All I’ve ever dreamed of was to be married with kids. When my partner died and the years started passing me by, I began to feel like the chances of that happening was pretty much zero,” says Kathryn. She ordered her first brown box and immediately enrolled in the 16-week IsaBody Challenge. Almost immediately things started to change. Kathryn also took her chance to credit the amazing encouragement and support from the IsaBody Challenge community and the IsaBody Finalists. 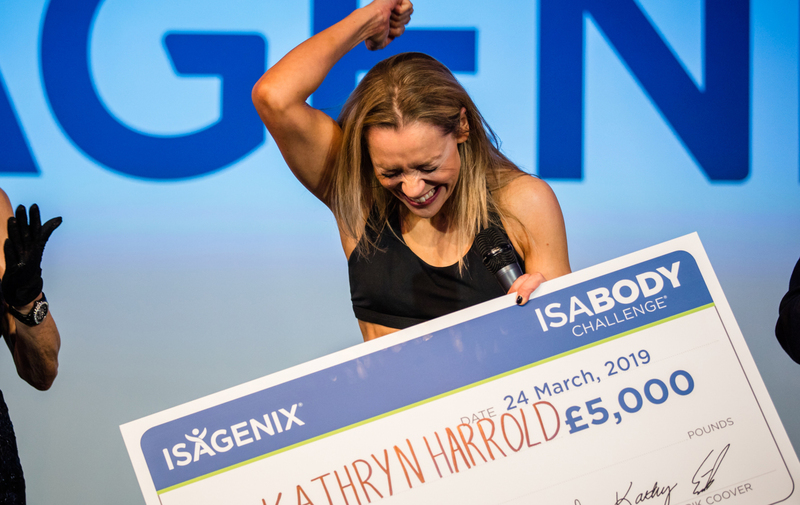 Kathryn will be representing the UK and Europe to go in the running for the chance to win the $50,000 Global IsaBody Challenge Grand Prize at our Global Celebration! Inspired by these incredible stories and ready to see yourself onstage as an IsaBody Finalist?! Register for the IsaBody Challenge today and discover how you can transform your life in 16 weeks. *The weight loss and lifestyle results depicted in this publication may vary depending on the level of effort, adherence to a controlled-calorie dietary regime, and physical constitution. The results were achieved when Isagenix products were included as part of a healthy lifestyle that incorporates regular exercise, appropriate portion control, and a varied and balanced diet to meet desired goals. Those who are pregnant, breastfeeding, or have a medical condition are advised to consult a doctor before using Isagenix products or making any other dietary changes.